A detailed series; decorated with ornate florals and embellished with Swarovski crystal elements. Available in hematite plate, burnished silver plate and burnished gold plate. Hinged cuff with a burnished finish. Featuring an eclectic array of various flowers set with Swarovski crystals and pearls. It measures 4cm/40mm wide at the front. Diameter 6.5cm/65mm. Long length pendant necklace. Burnished finish. 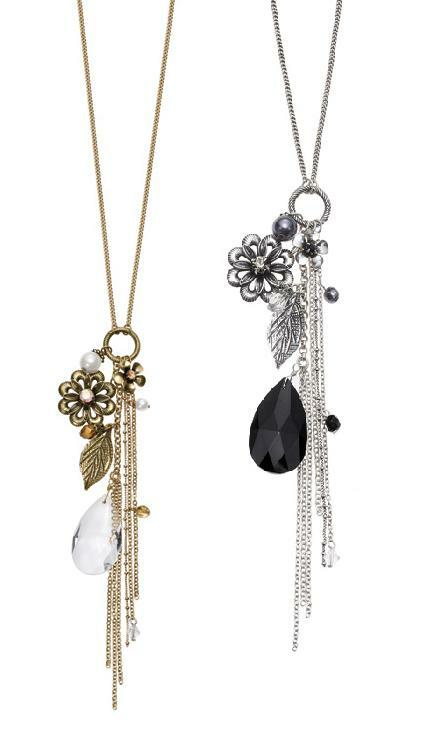 Featuring various flowers set with Swarovski crystals, a faceted crystal drop and leaf charm. The pendant measures 12cm/120mm/4.75 inches. The necklace measures 81cm/32 inches in length. The chain can be doubled-up to create a shorter length. Adjustable length bracelet. Burnished finish. Featuring an eclectic array of various flowers set with Swarovski crystals and pearls. It measures 19cm/7.5 inches to an adjustable 23cm/9 inches. The largest flower measures 1.8cm/18mm. Pretty flower ring with a burnished finish. Set with a Swarovski crystal. The flower measures 3cm/30mm. Adjustable ring shank/band. Pretty flower earrings with a burnished finish. Set with a Swarovski crystal. The flower measures 1.8cm/18mm. Total length 3cm/30mm. French clip for pierced ears. Make the ultimate statement with this beautiful necklace. The front drop measures 11.5cm/4.5 inches. Various flower motifs measure from 1cm/10mm up to 4cm/40mm. The length is 16 inches/41 cm to an adjustable 19 inches/48cm. Adjustable length bracelet. Burnished finish. Featuring an eclectic array of various flowers set with Swarovski crystals. It measures 7 inches/18cm to an adjustable 8.5 inches/22cm. The largest flower measures 4cm/40mm. Tear drop earrings with faceted tear drop and Swarovski crystal studded scroll-work frame. French clip for pierced ears. Tear drop measures 1.9cm/19mm. Total length 3cm/30mm. Crystal petal flower stud earrings. Flowers measure 1.8cm/18mm. Post style for pierced ears. Crystal petal flower studs with faceted tear drop earrings. Flowers measure 1.7cm/17mm, total length 4cm/40mm. Post style for pierced ears.